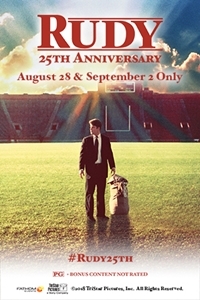 Fathom Events and TriStar Pictures are proud to present Rudy 25th Anniversary, coming to select cinemas for a special two-day event on August 28 and September 2, featuring an exclusive introduction. All his life, people have told Rudy he's not good enough, not smart enough, not big enough. But nothing can stop his impossible dream of playing football for Notre Dame. Some dreams won't die, as Rudy proves when he goes to heroic, occasionally hilarious, lengths to win admission to Notre Dame. An incredible true story from the creators of Hoosiers, Rudy is an unforgettable testament to the power of dreams and the triumph of the common man.